Mattis said Iran was playing a destabilizing role in the region but its influence would be overcome to try to reach a solution to the conflict in Yemen through UN-brokered negotiations. “Everywhere you look if there is trouble in the region, you find Iran,” Mattis told reporters in Riyadh after meeting senior Saudi officials. “We will have to overcome Iran’s efforts to destabilize yet another country and create another militia in their image of Lebanese Hezbollah, but the bottom line is we are on the right path for it,” Mattis added. 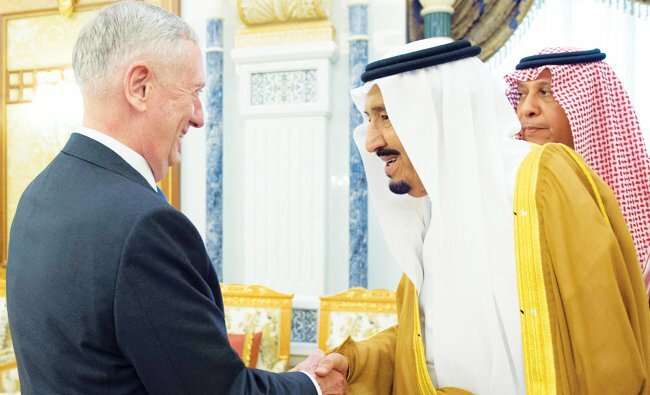 “What we can do here today could actually open the door possibly to bringing our president to Saudi Arabia,” Mattis said. The two sides pledged to work closely to broaden security cooperation and to ramp up support for the Saudi-led coalition fighting Iranian-backed Houthi militias in Yemen. Mattis’ talks with the king at Al-Yamamah Palace focused on “efforts to strengthen US-Saudi partnership,” said Johann Schmonsees, a spokesman of the US Embassy. Mattis discussed with the king and the deputy crown prince efforts to strengthen commitments to the US-Saudi security partnership, Schmonsees said. 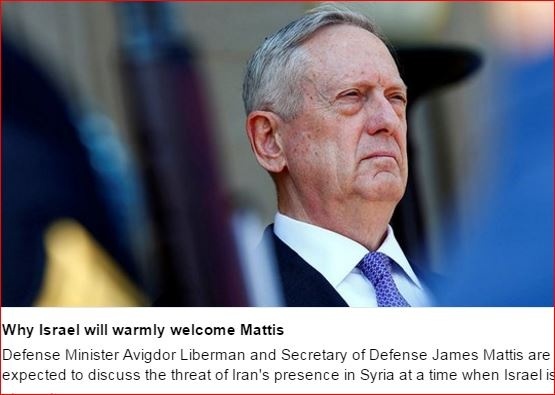 Mattis will also visit Israel, Egypt, Qatar and Djibouti. The Pentagon has billed the trip, Mattis’ fourth as defense secretary and second to the Middle East region, as an opportunity for him to discuss the ongoing fight against terrorism throughout the region. Mattis traveled to Egypt Thursday after wrapping up his two-day trip to the Kingdom. He will visit Israel Friday before returning to the Gulf Saturday for talks in Qatar. The trip is primarily aimed at boosting the alliance between the US and these five countries, which are important players in the region. And Nassrallah is Jesus Christ.. If Iran took over Lebanon completely they will do the same thing in Iran. There will be no different than Daesh and worse. And you would know who to blame before you were born. Yes I agree and Arafat helped in Jordan and Lebanon. 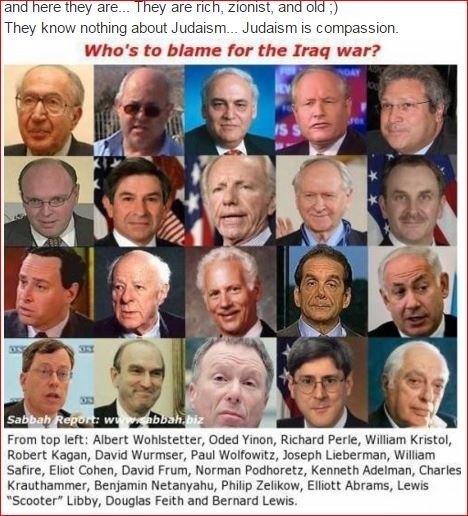 so no one who knows about Ben Gurion’s master plan or thinking then would not dispute that. But we helped him to do it. What prompted Arafat to attack Jordan, Lebanon and create armed camps.. who gave Mubarack, Assad, Saddam, Ghaddafi and Nassralah rain in their area and outside of it. We can agree on your point no doubt but we helped facilitate it for sure. Daesh is Saudi Arabia but how come you didn’t complain about Islamic extremism before Daesh.. you didn’t complain about the Saudis who supported Syria for decades while giving them over 2 billion dollars a year. How come Nassrallah and his stooges didn’t complain then or accused them of spreading Islamic terror? Why did Assad let loose thousands of Daesh from jails and even armed them.. why didn’t he bomb them in the beginning of war instead of Bakeries and children? why do you see one side only? 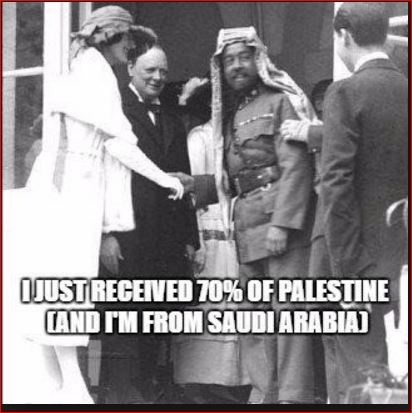 I ALWAYS complained about Islamist extremist, they didn’t exist before Wahhabi nouveau riches started corrupting and buying allegiances with oil millions… Saudi were the biggest traitors to Arab countries since WWI. The British helped ibn Saoud conquer Arabia from the Hashemite.., who had to move out. Churchill gave Palestine as if the land belonged to his aunt, gave Sheriff Hussein, Shark el Ordon Palestinian territories..